This Limitless update released by V update official is all about getting our gamers ready for 5th Job coming in December. To help gamers reach level 200, they are opening several events and applying some changes to help players level faster. There’s never been a better time to start and develop your favorite new hero with the Mega Burning Project event! For a limited time only starting November 30, create a new character and start earning two free levels for every one level you gain, and burn your way up to level 130! You only have 2 weeks to take advantage of this offer, so don’t wait! Who doesn’t love free gifts? For a limited time only, starting from level 140 and up to level 200, you’ll be able to earn some slick prizes for every 10 levels you gain with the Breakthrough V Event. Grab all the prizes, such as the Breakthrough Potions, while you still can. More free gifts? Sure, why not! 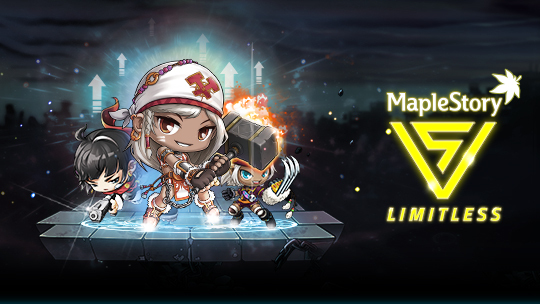 Participate in the special Play V Rewards Event to unlock even more cool prizes, from Red Cubes that enhance your weapons and armor to Maple Reward Points. Get them while they last! For a limited time only, collect randomly dropped V Boxes from all around the Maple World to collect V Coins, which you can use to purchase special new rewards! There are hundreds of amazing new and rare items to choose from such as, Rings, 50% Epic Potential Scrolls, Master Craftsman’s Cubes, and so much more! As we can see, Maplestory producers brings many changes to reach the goal "A Better Maple", and the change will be available on November 30th. Let's wait for a while and see which improvement have been done in the game.